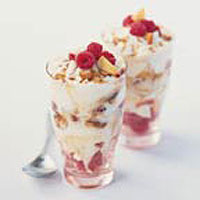 This lovely dessert is a healthier alternative to the famous Eton mess, which is made with whipped cream. Mix the fromage frais and yogurt together in a large bowl with 2 tablespoons of the brown sugar. Place a few raspberries in the base of 6 tall glasses, then layer with the fromage frais mixture, crushed meringue and nectarines, reserving a few larger pieces of meringue and some raspberries and nectarine pieces for the topping. Chill the desserts for at least 10 minutes or up to 1 hour. When ready to serve, sprinkle with the remaining sugar then decorate with the reserved pieces of meringue, nectarine and raspberries.